Penned in the Margins, 9781908058010, 200pp. Welcome to a strange new world in which a poem can be written using only one vowel, processed through computer code, collaged from film trailers, compiled from Facebook status updates, hidden inside a Sudoku puzzle, and even painted on sheep to demonstrate Quantum Theory. 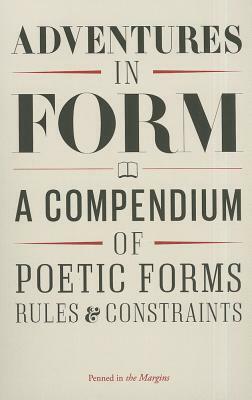 Discover a multitude of new and unusual poetic forms - from tweet to time-splice, and from skinny villanelle to breakbeat sonnet - in this inspiring and inventive anthology. Adventures in Form features over ninety poems by forty-six contributors including Patience Agbabi, Christian B k, Joe Dunthorne, Inua Ellams, Roddy Lumsden, Ian McMillan, Paul Muldoon, Ruth Padel and Hannah Silva. Edited and introduced by Tom Chivers.